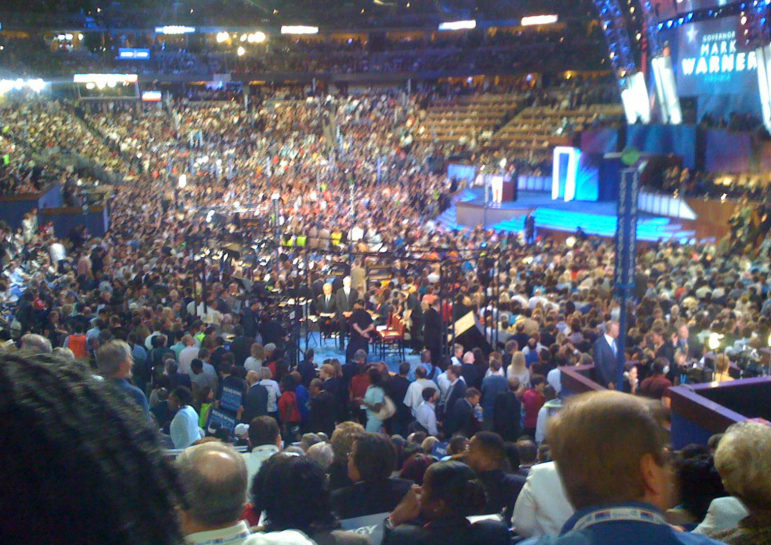 This weekend in Orlando, members of the Democratic National Convention’s full Platform Committee hashed out a new set of positions from the draft published on July 1st. The final agreements include some relatively progressive items—among them an amendment focused on criminal justice reform that notably calls for an end to the death penalty but also for Department of Justice investigations of any police-involved shootings. We will abolish the death penalty, which has proven to be a cruel and unusual form of punishment. It has no place in the United States of America. The capital punishment plank shows the influence of prospective nominee Bernie Sanders. His metaphorical signature is also evident in support for a $15/hour minimum wage, steps intended to break up too-big banks, and environmental moves like prioritizing renewable energy and limiting fracking. Sen. Sanders (I-VT) has refrained from a formal endorsement of Hillary Clinton until the platform, which is nonbinding and must still be ratified at the convention, was crafted. Sanders has apparently been playing an active waiting game, but on Saturday he told reporters that the campaigns are “coming closer and closer together in trying to address the major issues facing this country.” Pundits expect his endorsement on Tuesday. Democrats believe that the current minimum wage is a starvation wage and must be increased to a living wage. No one who works full-time should have to raise a family in poverty. We believe that Americans should earn at least $15 an hour and have the right to form or join a union. We applaud the approaches taken by states like New York and California. We should raise and index the minimum wage, give all Americans the ability to join a union regardless of where they work, and create new ways for workers to have power in the economy. We also support creating one fair wage for all workers by ending the sub-minimum wage for tipped workers and people with disabilities. Democrats will fight for comprehensive federal non-discrimination protections for all LGBT Americans and push back against state efforts to discriminate against LGBT individuals. We will combat LGBT youth homelessness and improve school climates, and we will protect transgender individuals from violence. We will promote LGBT human rights and ensure America’s foreign policy is inclusive of LGBT people around the world. Democrats are committed to protecting and advancing reproductive health, rights, and justice. We believe unequivocally that every woman should have access to quality reproductive health care services, including safe and legal abortion—regardless of where she lives, how much money she makes, or how she is insured. We believe that reproductive health is core to women’s, men’s, and young people’s health and wellbeing. We will continue to stand up to Republican efforts to defund Planned Parenthood health centers, which provide critical health services to millions of people. We will continue to oppose—and seek to overturn—federal and state laws and policies that impede a woman’s access to abortion, including by repealing the Hyde Amendment. We need to defend the ACA, which extends affordable preventive health care to women, including no-cost contraception, and prohibits discrimination in health care based on gender. The platform holds much more, of course (like a resolution to remove marijuana as a Schedule I federally controlled substance, “providing a reasoned pathway for future legalization”), and we encourage our readers to offer their commentary either in our comments or an op-ed. As a concluding thought, NPQ would like to acknowledge that although this platform will contain a few positions long advocated by many in the civil sector, and some mention is made of movements and even individual organizations among our field, there is no specific language on supporting the civil sector or the role of nonprofits and philanthropy in our society. For too long, US criminal justice has been based on retribution, with the death penalty set forth as the ultimate punishment. Not only has this system failed to promote public safety, it results in persistent racial bias. A new paradigm based on restorative justice that can heal communities, especially communities of color, is desperately needed.